Pete and Maura Kennedy, perennial festival favorites. will bring energy and excitement to the New Revival Coffeehouse on Dec. 1. The Kennedys, both East Coast natives, met in Austin, Texas, joined forces with Nanci Griffith’s Blue Moon Orchestra for a couple of years, and set out on a road that, for two decades, has led them not only west but all over the US and the UK many times. Their music seamlessly weaves their influences over the last two decades: Buddy Holly style roots, the tuneful cadences of the Everly Brothers, and the ringing 12-string jangle of the early Byrds, interspersed with moments that recall British folk rockers Fairport Convention. 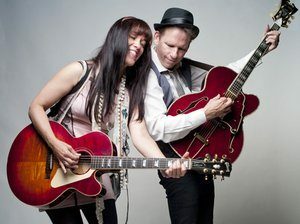 After two decades of performing together Pete and Maura are hitting a songwriting and performing high point. Tickets are $20 at the door or $17 in advance at BrownPaperTickets.com. For more information, see KennedysMusic.com.